I mentioned in the initial Anatomy of a Pen post that you could have several types of grinds on a pen. I was just re-reading a source I’ll be talking about in a future post, Steel Pen Trade, by A.A.S. Charles, when I came across a section I hadn’t noticed the first time. Charles was writing in the 1980’s about his experience from the 30’s onward working in the industry. He knew folks who had made pens in the 19th-century so could speak to the means they used to make pens. But his is a very British viewpoint, so that should be taken into consideration. Much of the booklet is comprised of his descriptions of how they made pens, step-by-step. When he’s talking about grinding (page 19) he mentions that there are three types of grinds. Cross ground. This is the grind up near the tip across the axis of the pen. Letter ground. This third grinding is a decorative grind. He calls it a letter grind because often when you had an embossed letter pen, like the famous “J” pen with a raised “J” in the embossed area, they would grind off the top finish to better expose the letter and make it stand out from the darker ground. I’ve seen examples where this third ground is not done on an embossed design, but is instead used to create a highlighted patch of bright steel to contrast with the rest of the pen. One recent example I acquired was a Perry Colonial Pen. Perry was one of the very first, biggest and best of the British pen makers. In this pen, the grinding is especially well-done. You can see clearly from the first photo below the double grind. There’s the clear cross grind that extends across the axis of the pen, along the slit from the end of the hole forward toward toward the tip. (this grind should not touch the tip because that might make the tip either too fragile, and/or scratchy) You can also see the lighter color of the straight grind around the hole. What’s not as clear from that picture, but can be seen in the one below, is the third grind, behind the hole toward the heel. The bright patch of grey steel contrasts nicely with the bronze finish of the rest of the pen. And so that you can see a true “letter grind”, here’s an old William Mitchell (British maker) X-Fine “J” pen. The black finish shows off the letter grind particularly well, even if it makes it more difficult to see the other grinds. It also makes it pretty obvious why it was called a “J” pen. They made other letter pens, but the J pens were the most popular. There’re not a lot of authoritative documents on terminology, so I figure we should get some basic vocabulary defined up front. That includes the parts to a pen, and how we identify a pen. Not everyone will agree with all of my terms or definitions. I welcome productive discussion, and suggestions for alternatives. Pen: Long before fountain pens, a “pen” was any writing implement. By the 18th-century it was a general term for any writing implement that used ink, and, starting in the 19th-century, it meant what we now call a “nib.” You would write by dipping a pen, held in a holder, into ink. Until very late in the 19th-century, anytime you used the term “pen” you meant just the metal part at the end of the holder. You would buy a box of steel pens or a gold pen to write with, and you would need a holder or “pen case” to hold it. Nib: Originally (at least by the 17th-century) the nib was the tip of the quill or, later, the pen. 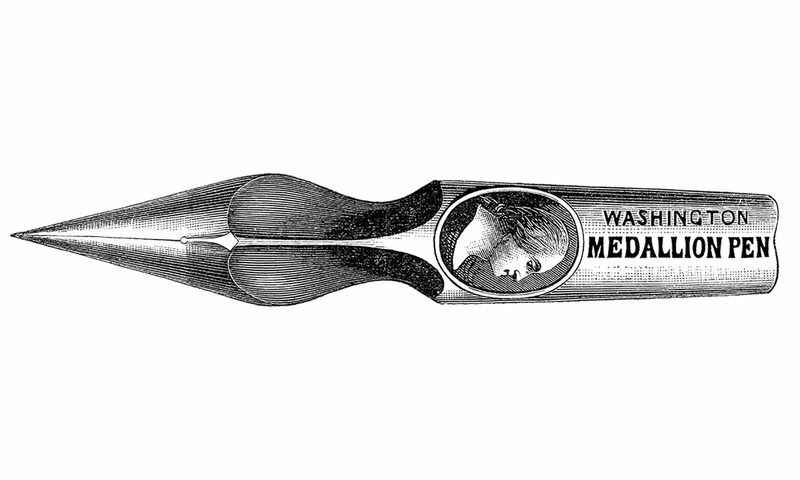 What we call the tines were often called the “nib” of the pen. When modern fountain pens began to be made in the mid-late 19th-century, you begin to find “nib” used to indicate the metal tip of a fountain pen, the “pen” of the fountain pen, as opposed to the body which held the ink. As this usage becomes more common, you can also find an occasional reference to a dip pen as a “nib.” The earlier usage of “nib” to indicate the tip or tines disappears. By the time dip pens pretty much disappear from regular usage, i.e. the 1950’s, “nib” means the metal part of a fountain pen, and “dip nib” is used to differentiate the ones used in holders from the fountain pen nibs, and “dip pen” commonly refers to the whole dip nib and holder combination. This usage continues today. Pointed pen: A type of pen that has a pointed tip. Contrast this to a broad-edge pen. Broad-edge pen: A type of pen where the tip is cut across rather than comes to a point. Broad-edge pens can come in many styles from very fine stubs to broad, sharper points used for decorative writing and engrossing. The edge of a broad-edge pen can be perpendicular to the axis of the pen, or it can be but at an angle, these are called oblique cuts. There is left oblique and right oblique. The easiest way I’ve read to differentiate the two is to think of a left foot and right foot. The toes on your left foot generally slope from lower left to upper right, and vice versa on your right foot. If the oblique nib looks like a left foot then it is a left oblique. If it looks like your right foot, it is a right oblique. Style: Each pen has a particular style. Most manufacturers made a number of different styles. These styles are differentiated by several factors. Name: Many styles of pens were given names to help with marketing. Often, names were related to a profession to which the pen was mainly marketed, such as Judges Quill, Bank, or Commercial. Others tried to market a pen to a particular school of penmanship, especially the short-lived fad for Vertical Penmanship. Most every major company, for example, produced a “Vertical” pen in the last decade or so of the 19th-century. Number: The main way of distinguishing styles, is often by the numbers. It’s not uncommon for a single number to change names over time. Esterbrook is notorious for this. Shape: Pens come in many shapes. Some shapes have known names, like the Falcon, others do not. Shape is one aspect of a pen’s style. I have a suggested set of standard shape names here. Finish: Most pens were made of steel, though there are some exceptions which are still counted among steel pens. Over the steel, as a protective measure to reduce corrosion, these pens are given a coating. Sometimes this coating is just a clear shellac, sometimes the pen is given a metallic coating, such as a silver alloy, or gilding. For most pens, when you see another metal associated with them, like aluminum, silver, etc… it refers to the coating, not the main material of the pen. (or has absolutely nothing to do with the actual construction of the pen but is associated with the pen for marketing purposes, see Leon Isaac’s Glucinum Pens) Some of the finishes can give the pen a different color. Color: One of the last steps in manufacturing steel pens is to heat the pens to give them a specific color. Heating will get you pens which can range from grey to “white” or different shades of “bronze.” These bronze colors can range from a dark, purple-brown color to a lighter tan. Some colors are a result of a finish. (see above) The most common colors you see from a finish include: silver, gilt and black. Silver comes from a metal alloy, often containing silver, nickle or even mercury. Gilt is a gold coating, which is usually quite thin. Black is also often called a “tar” coating and is most likely a tar-related substance. Flexibility: Today, especially in these flexible-fountain-pen-mad times, flexibility tends to only be measured in spread. Flexibility is actually comprised of several aspects of a pen. One is how far apart the tines of a pen will be able to spread during normal use (flex), another is the force needed to spread the tines (softness) and the third is how rapidly the tines come back together after spreading (spring). In the old days, it was more complex, and instead of just talking about flexibility, the pen makers often used the term “action.” This involved all aspect of flexibility as well as smoothness of the writing experience. Tip Modifications: From the very beginning of steel pen manufacturing, it was clear that a pointed pen could be scratchy. Makers tried all kinds of ways to alleviate this problem. There were two main ways of fixing this issue: adjusting the tip so that it doesn’t come to a sharp point, and to create stub nibs. Turned up tip: One of the two main ways of adjusting the tip is the turned-up tip. In this technique, as the name suggests, the tip is actually turned up slightly so that you are writing with the flatter underside of the tip rather than the sharp end. Round Point/oval point/bowl point: The other technique was to emboss in the very tip a small, round, indentation. This causes the pen to contact the surface of the paper on this round indent rather than the sharp tip. Another term for this was a Ball Point Pen. I hear this name lives on in some kinds of modern writing instruments. Axis of the pen. The imaginary line along the pen from tip to heel. Slit. The cut made at the front of the pen to create the tines. There can also be side slits, which are slits made along the side of the pen to increase flexibility. Side slits can be a simple slit, a t-shaped slit or even a cut-out which removes material. The grind. Some nibs were ground on an emery wheel. This grinding away of a small amount of the steel is mainly used to increase the flexibility of the tines. Grinds can be single grinds, where the grinding is down by the tip and the lines are perpendicular to the axis of the nib. They can be a double grind, where the nib is ground again around the hole with the lines now parallel to the axis of the nib. And a few fancy nibs may even have a third grind behind the hole, toward the heel, usually for decorative purposes. In the UK, pens were hand ground much later than in the US where labor was more expensive. Here, companies first went to a quick and inexpert grind, then tried stamping lines into the tines to get the same effect, and eventually just eliminated it altogether, especially as taste in pens moved more towards stiffer pens in the days of business penmanship and carbon paper. Shoulders. The shoulders of the pen are where the tines transition into the body of the pen. You can sometimes find side slits at the shoulders. Body of the pen. The body is the part between the tines and the heel of the pen. In some pens there is a distinct heel, in others it’s a continuous line all the way to the end. In those cases, the heel is found toward the end and would be defined as just the part that goes inside the holder. Embossed design. Some pens will have an embossed design between the body and the heel. This is not common, but it is seen on some older or European Pens. Heel. The part of the pen which is inserted into the holder. Imprint. The imprint is any writing on the pen usually comprised of a maker’s name, a number, name for the style, and often a location. I’m sure there will be other terms that come up and I will continue to add to this page as I go along. Feel free to suggest other terms for me to add.